John C. Houbolt explains his space rendezvous concept for lunar landings. 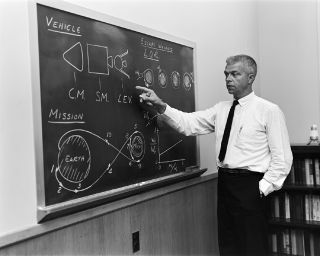 In this historical photo from the U.S. space agency, John C. Houbolt stands at a blackboard, showing his space rendezvous concept for lunar landings on July 24, 1962. Lunar Orbital Rendezvous (LOR) would be used in the Apollo program. Although Houbolt did not invent the idea of LOR, he was the person most responsible for pushing it at NASA.